The type of punching bag stand you purchase has a huge impact on how you train. If you want to train as fighters do, there are some features that inevitably make certain bags into the best punching bag stands on the market. In addition, the punching bag stand will have all of the features you need to train hard and see significant changes in your muscles for your fighting style. With this guide, we also include some of the stand reviews. A punching bag stand will use high-grade materials designed for impact. Some bags are designed to train specific fighting styles and exercises. In this case, the design and filler are just as important to picking the right bag as the exercises you plan to do while training. The great part about bag stands is that you have a number of options. There are so various styles, brands, and designs that will stand out to your interests. It may be made of leather and have bright colors or perhaps it’s a sturdy, vinyl bag that matches your budget. Many fighters base their bag stand preferences on their heavy bag’s weight, size, and style. Some bags are well known in the industry, and others are avoided due to poor construction. This punching bag stands reviews goes over the unique advantages of each punching bag and recommends which bag suits your style of training. The Everlast Heavy Bag stand is a standard you will find in most gyms and garages. Fighters trust the Everlast brand to create durable products that handle all bag types. With Everlast logos down its black frame, the heavy, powder-coated steel tubing stand works for most punching bag models. There’s a lot to like and dislike about this budget-friendly bag. For one, it is the best punching bag stand for home use. At 84.13” in height and 48.25” in width, the bag stand also includes three weight plate pegs to keep bags up to a 100 pounds in place. However, you may experience some wobbling unless you attach your stand legs to the floor. The durability factor is important if you train every day as your stand will need to handle the impact over time. Despite needing extra weight if you have high impact exercises to prevent wobbling, the stand’s construction lets you use any bag. The simple, sleek design of Everlast brand products also just speaks to its history and makes it seem like it belongs in the gym of a fighter. Many fighters use the Everlast brand exclusively because of its historic ties to different fighters. This is one of the best boxing bag stand builds that you will find for the price. Everlast put a lot of thought into making this stand accessible to fighters in all stages in terms of price and ease of assembly. This stand is incredibly easy to set up. You can hang your punching bag in minutes and start up an exercise. Most fighters start out with a low-cost heavy bag stand and a standard 100-pound bag. This stand is awesome for those who want to quickly set up a new bag and just start hitting those reps. However, there are some parts of the design that hinder different exercises requiring a lot of footwork. In that case, another stand that is more open would work better. For the price tag, you cannot beat the value that this stand delivers. The Everlast bag stand is a standard for punching bags up to 100 pounds. If you are just starting out and want a sturdy stand, this is a great option that lets you work a lot on your form and hit style while able to withstand great impact. 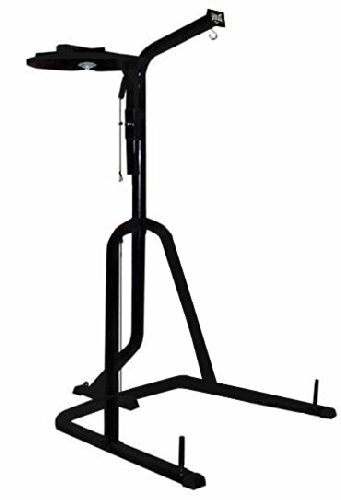 Most people think that heavy bag stands should be cheaper than the bag, but not in the case of Century Cornerman’s stand. This is a heavy bag stand with ultra-stability design that lets you keep hitting and hitting without so much as a twitch. Fighters can expect this heavy bag to withstand powerful strikes due to its suspension system design and shock-absorbing features. Century Cornerman is another popular brand in heavy bags. The feet of this stand are made of polyurethane rubber, which adds an extra bit of durability to keep the stand in place as you go through your routine. The greatest part about this stand, and the reason why it has a higher price pag, is that you can adjust from 72 inches to 102 inches in height. Legs also extend out 7.5 from the corner, which is perfect for those who love footwork exercises. You can hold up to a 100-pound bag with this stand. This bag is made to withstand arm and leg exercises. This stand will take a little bit more time to assemble correctly, but it is worth it to have an adjustable arm that you can hang the bag for different heights and fighting styles. The price of this heavy bag stand is a little high for those who are just getting started. However, if you want to develop a well-rounded fighting style with lots of footwork, leg exercises, and powerful strikes, this stand can take whatever you throw at it. This stand is made for fighters who are heavy into training and want to try different fighting styles. Even at the high price, this stand is incredibly durable and gives you a lot of room to work. Due to its design, you will need a wider area to train with this stand. The Balazs Universal Boxing stand is for every fighter and punching bag. The design makes it a great addition to any gym, whether personal or professional. In addition, it is one of the only bags to support up to 300 pounds. This is the real deal when it comes to professional punching bag stands. There are no extra weights needed for this frame, as it is totally freestanding and made from high-grade steel. The frame is made to hold up to a six-foot long punching bag. While you most likely will only need a 100 to 200 lb punching bag, you can hang up to 300 lbs on the Balaz. This is beneficial for fighters who are larger, heavy-hitters. There are some upgrades available. You can purchase a Speed Bag Platform to train with smaller bags. You will likely need some help putting this stand together as it is very heavy and may need to be bolted to the floor. You want to make sure that the stand is in an open area as well. Most professional gyms will be able to afford a stand like this for their home, but you may want to look elsewhere if you are trying to work out on a standard 100-pound bag. While the heavyweight construction and frame is perfect for open boxing, you can get more value out of some of the smaller stands. The Balazs bag will make you a stronger fighter over time if you have the money to invest in it. Versatility is an amazing feature to have in a heavy punching bag stand. Everlast delivers with a two-station heavy bag stand for speed bags and heavy bags. The design of the Everlast 2 Station Heavy Bag Stand is impressive. Sleek with an adjustable platform height is important for speed bag training, then the other side is all for the heavy bag. The heavy-duty, powder-coated steel tubing is combined with weight plate pegs for more strength and durability. 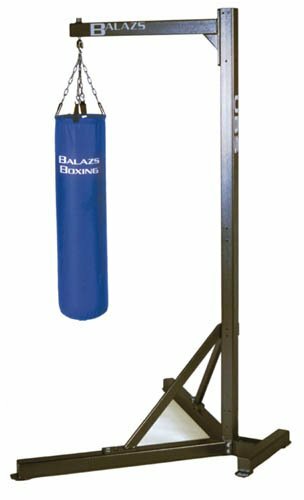 Heavy bags up to 100 pounds can be hung from the stand as well as multiple speed bag styles. The stand also has a rather small footprint, so it is able to fit any room in your house, garage, or small gym. Everlast has a design that is made for easy assembly, but this stand has a few more parts than your typiceal one-bag construction. You may spend some extra time trying to figure out how to attach the arms to this stand than in other bags. There is a ton of value to this stand, but if you are a heavy hitter, this stand is probably going to be a waste of money. If you are training multiple fighting styles or just starting out, this is a great value for those on a budget. The Everlast brand puts out another great product for fighters who want to train on multiple bags and need adjustable height options. If you are a heavy hitter, then you probably want to alter the construction to bolt the legs to the floor. What will they come up with next? 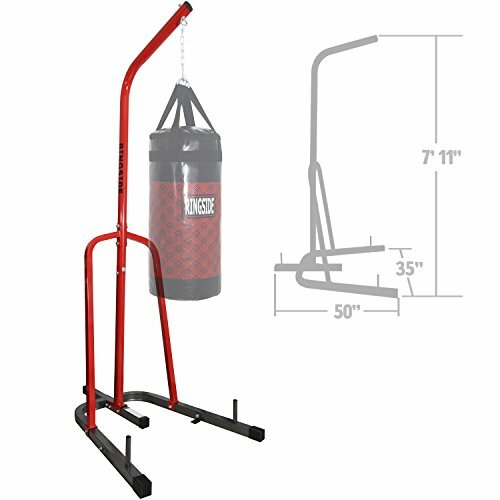 Everlast now has a three-station punching bag stand available for those who want a lot of different options for double-end bags, heavy bags, and speeding bags. Is it a great option for your fighting style? It does not matter as much, but fighters love having a stand with so many options for training. This heavy bag stand was made for those who love to train at home and want to get the most out of their exercises. You can hang three different bags on adjustable arms with this stand including the speed bag, double-end bag, and heavy bag. If you are training in both boxing and MMA, there are a lot of things to love about this bag. For one, it has a solid steel construction, and its incredible sleek to the eye. There is a lot of open area to work due to the position of the arms. It has a lot of versatility if you want to train as much as you can in every fighting style. Everlast does pride itself on making easy to assemble boxing stands. However, there are a few things that are different about the 3-station that have been causing issues. This one is a little bit trickier, and there are some complaints about different pieces being missing or needing some additional work to bolt down the legs for a more stable, heavy-hitting solution. Everlast products all seem to be priced similarly, and it is easy to compare the one-station, two-station, and three-station together. If you want to spend slightly more money, the Everlast 3-station bag will give you the ultimate training experience for different styles. Everlast continues to be the most versatile brand in boxing and provides a 3-station bag for those who want to training in boxing and MMA fighting styles. The value is best for those who do love to train with different bags. The XMark Deluxe Power Tower and Heavy Bag Stand is all new piece of gym equipment that has been popping up in several fighting forums. These stands become an all-for-one training battle station for fighters who want to do multiple exercises to build muscle and more powerful strikes. Truthfully, the construction of the Power Tower and Heavy Bag stand look so seamless that it really does make you want to train from the first glance. The design is very sleek, there are several components, and overall, it just makes you want to start exercising the heck out of your body. 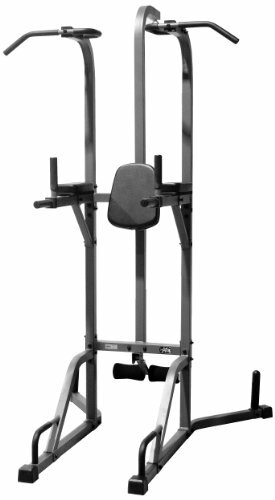 The XM-2842 is the brainchild of XMark Fitness, and it combines a vertical knee raise, split grip pull-up bar, push-up station, and heavy bag stand in the same frame. The materials are high-quality including the 2.5-inch thick cushion with incredible stitching, tear-resistant Duraguard vinyl grips. This station was made for long-term, daily use for trainers that want to go hard on every muscle during their exercise routines. It has a heavy 14-gauge steel mainframe construction that has a scratch-resistant, black powder coat finish. The stand is also 94” inches high, which can be difficult if you have low ceilings. The stand is also adaptable for different weights that you might be using. You can use the Olympic adapters or remove to use standard plates. ...It can also hold a 100-pound heavy bag without wobbling. This is key as some frames of difficulty staying in place with powerful strikes, but XMark has created this stand to be extremely stable and durable. This stand is worth the time it takes to assemble, but some of the pieces are quite heavy so you may want to enlist the help of someone to set up. Everything is shipped in one box, which adds to shipping costs if purchasing from certain online stores. The legs may also need to be bolted down for those who are used to heavy-hitting. The all=in power tower and heavy bag stand make for a great value for any fighter who is in serious training mode or just likes a variety of exercises while training to keep sharp. If you can get free shipping, you will avoid some of the higher shipping costs as the weight is higher for standard shipping rates. Xmark Fitness has created a very versatile training station. If you are a fighter who is training every day and want to spice up different routines, this is the perfect stand and power tower to do so. Even from the first glance, this stand does not look like it can take a hard hit. However, Everlast tries to deliver a solid MMA product with a pulley design and two bag height settings. The design of this stand is just not appealing to any fighter. It looks incredibly flimsy and only has three weight plates that do not hold the bag stand down for those heavy-hitting exercises. Overall, the OmniStrike pulley design does not work for stability. One of the features that Everlast staters is that you can take easily detach and attach heavy bags so you do ground fighting exercises. The stand has a heavy-duty powder-coated exterior made from steel tubing and combines three weight plates. The design comes with a pull-up bar, but some designs are different depending on the year you purchase this product. Overall, customers have reported that the stand is not sturdy enough to support pull-up training. There are only a few parts, but some of the assembly instructions are difficult and make assembly a longer process. In addition, some customers reported missing pieces or incorrect measurements with holes in the wrong areas. This caused issues for several customers. Overall, there are other bag stands under Everlast that have more versatility and have a lower price tag. If you are an MMA fighter looking for a pulley design bag stand, this would be the only one worth your time, but there are other options that are cheaper that have a sturdier construction. Ringside puts together a great free-standing station that makes it easy for punching, footwork, and leg routines all in one. The free-standing fitness station is just that. With designs that work for non-mounted heavy bags, you can exercise wherever is most convenient at home. 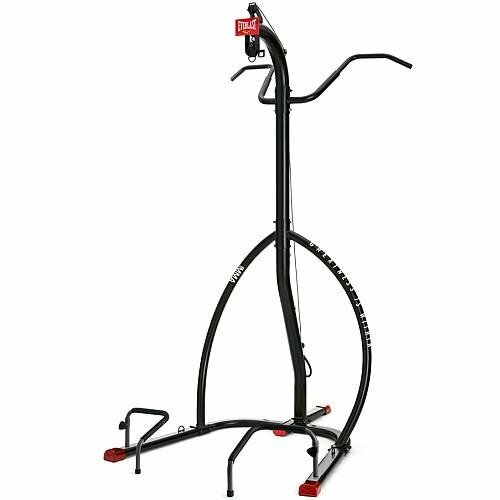 This stand is not exactly made for professional gyms but can be a great 100-lb bag stand for beginners. This stand works well for a long bag and can fit in most rooms, even if you have low ceilings. While the 360-degree hanging bag is just one up from the free-standing station, you get 180-degree access to the bag and can run most footwork exercises. The stand is very easy to assemble and only has a few parts. You may find yourself bolting down the legs due to the lack of weight plates that would make this a sturdier stand. 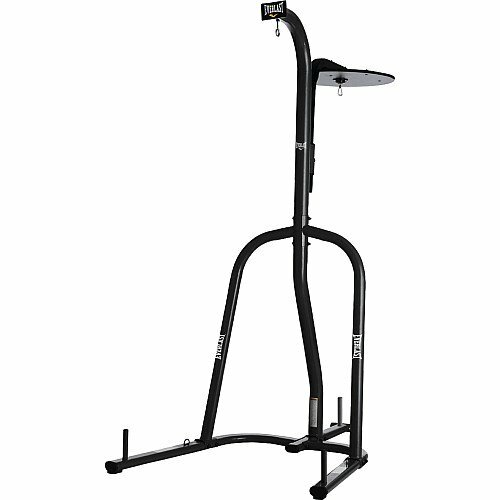 Overall, Ringside puts together a sturdy bag stand for the price that allows you to do a lot with a small amount of space in your training area. 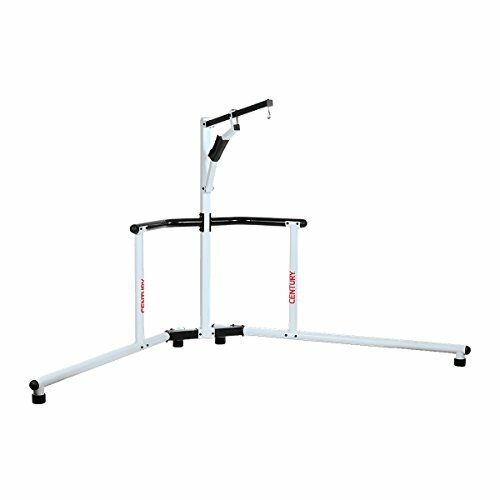 The price tag is comparable to most single bag stands that do not have adjustable heights or other bars for speed bags. For a simple heavy bag stand, this one is very sturdy and easy to assemble. This one works well for beginners who want to get started on a 100-lb bag. Love footwork? Then this stand is perfect for you. The Yes4All Wall Mount Heavy Bag Hanger offers a way for you to hang up a bag in your gym or home with all of the right tools. 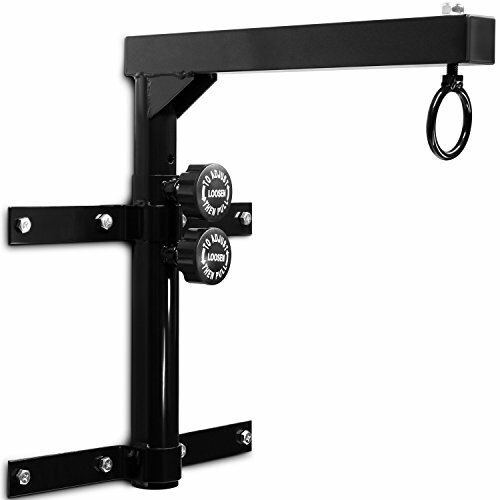 The Yes4All Wall Mount is a heavy-gauge steel construction bar that attaches to your wall and has an optional swivel chain design. The materials are high-grade and support up to a 100-lb standard heavy bag. This wall mount is designed with a pull-pin adjustment swivel so you can swivel the heavy bag while you are running through your routine. The 360-degree swivel chain is included. This may not be the bag stand of choice if you do not want to put holes in your walls and ceiling. You can attach this wall mount to any concrete or 12” wood stud. As you can imagine, there is a lot of weight and impact on a bag like this, so you want to ensure that you can install the wall mount and use continuously without incident. The wall mount is great for those who want versatility and 360-degree training for footwork and leg exercises. As it can accommodate any fighting style and has a hardy construction, you can get a lot of this type of bag. The wall mount can be the perfect addition to anyone who wants 360-degree training. However, you should make sure that you have the right support to make sure that you can use it properly. Some features are more important when choosing a bag than others. Here are a few that we look for in the perfect punching bag stand. All materials for a bag stand should be high-grade steel so that it is durable and can withstand powerful strikes. No one wants a bag stand that wobbles whenever you hit the bag. Your bag stand should come with weight plates and instructions on making your bag more stable through bolt attachments to the legs. You may want to attach a speed bag or double-end bag as well as a heavy bag. There are training station bag stands with more than one attachment or arm to hang different bags. There are some stands that have high price tags and may offer versatility, but this may be overkill for a beginner fighter just starting out with training. If you find that you want to do a lot of different exercises but want to stay on a budget, you do not have to spend much to get a great bag stand. Height and width specifications should be considered when choosing a training room and placement for the stand. What type of warranty comes with the stand? Most have a 120-day warranty, but some of the more expensive stands have a one-year warranty. Adjustable heights are important if you plan on switching up styles from boxing to MMA or if you are a larger fighter. Our favorite bag stand and training option is the XMark Fitness Power Tower and Heavy Bag Stand. With this, you can train all parts of your body and attach different bags to suit what you want to do with your hits. It is an incredible value for the variety of training that you can do.